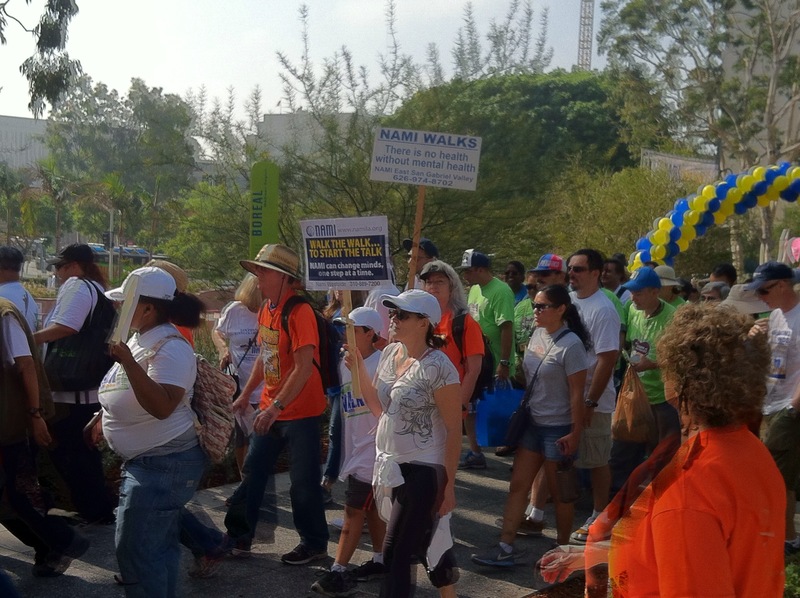 This year’s NAMI walk was at Grand Park Performance Lawn at 200 N. Grand Ave. and 201 N. Hill St. With thousands of people coming together publicly to help break mental health stigma, today wasn’t only about walking. It was about hope, love, and valid information advocating support for those affected with a mental illness. “NAMI, the National Alliance on Mental Illness, is the nations largest grassroots mental health organization dedicated to building better lives for the millions of Americans affected with mental illness,” a statement from NAMI. Several participants that were interviewed shared relatable stories of how NAMI impacted their lives. Hedi Vasquez, expressed that NAMI has educated her in a lot of ways concerning mental health, and emphasized the free of charge services. Rosanne Spencer, after having a mental breakdown, volunteers at events such as NAMI walks to “pay it forward.” NAMI gave Rosanne hope, support, and love, and she pays it forward in return by volunteering. NAMI offers family support groups, peer groups, mental health referrals, and updated facts about mental health news. Within the groups/courses topics varies from types of illnesses, to medications, to communicating about symptoms, to dealing with individual/family crises and recovery. According to a staff at the NAMI walk, Linda Kirkwood, those who want to attend the groups/courses will have to be consistent. It’s a 12 week group/course that is mandatory. When asked why it was mandatory, Linda says, “the teachers are volunteers. They take their time out to inform those that are willing to be educated.” Linda additionally gave a testimony about her own son. She said that it was “devestating” when she found out he was affected with mental illness. However, through the Family-to-Family groups/courses she attended, light was shed on her perception about mental illness and she sees mental health differently. By doing the walk(s), those that are mentally ill gain support by the public, they help break stigma, and give hope and aspiration to others affected with mental illness. The NAMI walk is essentially a fundraiser to support family or family members with a mental illness and raise public awareness. NAMI is committed to equipping and training grassroot volunteer facilitators who provide individual and family support groups in thousand communities across America and never grows weary. Los Angeles, due to it’s big county, has 12 sectors.NAMI has many sponsors and political supporters that work diligently to help fund for events, inform NAMI of statistics, and help also to break stigma. Jackie Lacey, Los Angeles District Attorney, in a statement addressed at the NAMI walk said, $3million will go towards training police to better handle those that are affected with mental illness. This issue may have risen concerns after an officer in Ferguson, Missouri, shot and killed a young black man (Michael Brown) known to be mentally ill. As the event came to a close, raffles were done, green ribbons were given out for Mental Health awareness week, and a celebratory drumming congratulating those that completed the walk. NAMI do annual walks and each location is different yearly. If you’re interested to know future walks or events visit: NAMI.org. You can too help make a difference in breaking mental health stigma throughout America or your community.